Billinge and Orrell in Transition began in 2009 as an offshoot of the now largely dormant Wigan Transition Town. It’s a suburb of Wigan with a population of about 10,000 which has, over the last 40 years, changed from being semi rural to now being semi urban. It has gone from 4 butchers, 3 greengrocers and 4 bakeries to now just 1 butcher and a Cooperative supermarket. “It had become more of a commuter place. I could see the community fragmenting, people turning their backs on each other. They don’t talk the same anymore. I could feel the community going, and I felt we needed to step in”. Mandy Wellens-Bray: Billinge & Orrell Transition. The wonderful video, above, which was made especially for our 21 Stories of Transition. From shortly after they were founded, Transition Billinge & Orrell had their eyes on a 30 acre farm owned by the local Council which had stood empty and neglected for 20 years. It took 4 years of what Mandy Wellens-Bray from the group calls “nagging”, to persuade the Council to finally make the site available to the community using an Asset Transfer and a 25 year lease, as well as to provide them with set-up funding. Greenslate Farm was born. 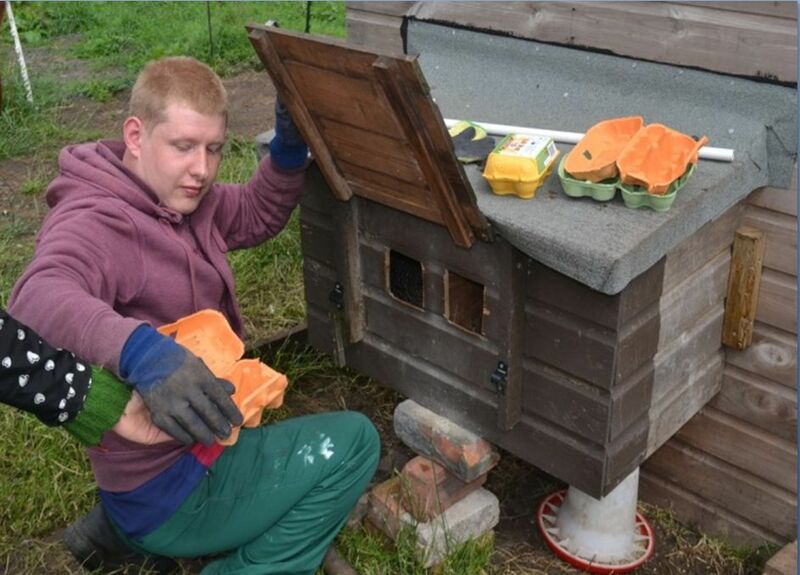 With the Council closing many of the care services it formerly provided, Greenslate Farm was imagined as a ‘Care Farm’, which led to funding from Wigan Council via their Community Investment Fund (The Deal) and UnLtd, providing a range of services to people in need, from those recovering from addictions to adults with additional needs. 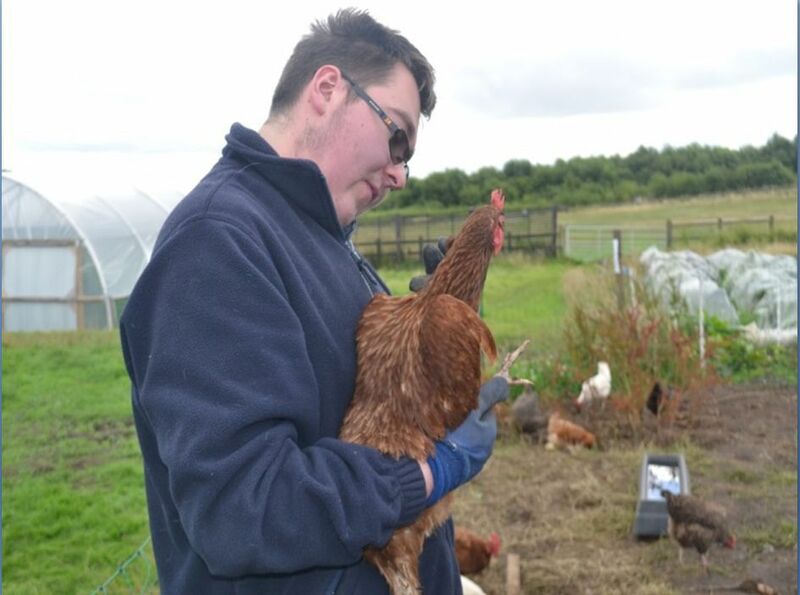 A range of therapeutic activities are laid on at the farm which, in part, cross subsidise other aspects of the farm, such as the market garden. A recent Storybook produced by Sabesan tells the story of three people who come to Greenslate though the National Citizens’ Service. Jonathan loves to collect the eggs from the chicken coup. He works closely with his brother in law, Ian. He also enjoys looking after the animals at Greenslate farm. 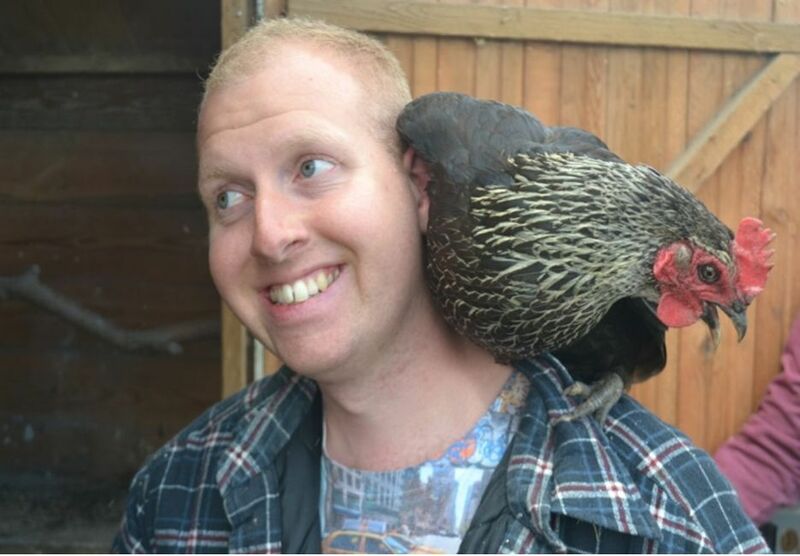 Liam visits twice a week and is a keen member of Greenslate Community Farm. His biggest responsibility and favourite task is looking after the animals. He takes great pride in collecting eggs, mucking out stables and giving animals fresh food and water. He has been a part of the farm since the beginning and is enthusiastic about the future of the farm and its development. Josh is keen on gardening, helping with the vegetables and the sensory garden. He cares for the animals on the farm; his favourites are the goats. Josh’s favourite job is sorting deliveries and pricing in the farm shop. He likes to grow lots of veg, especially beans and peas and enjoys cooking with them. Helping others comes easily to Josh, especially when new visitors are settling in to the farm. Josh and Liam have a close friendship and are more like brothers. £575,574 in grant funding support from various agencies and funders. Future plans include a new, L-shaped, load-bearing strawbale building which will be host to a professional kitchen, a community bakery, a cafe, a shop area and a dairy as well as two small offices. Funding is now in place from Public Health England and Power to Change (a Big Lottery funding stream), and work will start soon. It will be built by volunteers from the local community as well as those from the Recovery Partnership, people recovering from drug and alcohol addictions. They are also looking into the creation of genuinely affordable housing in an area where there is very little. In 2016 the group plans to host a regional REconomy gathering, in order to continue promoting a wider culture of entrepreneurship in the area. "As communities and individuals, we can change the world. Just give us the opportunity. Put the opportunities in local people’s hands".